Birlibam is the name of your new digital business card. And it’s awesome. Birlibam was inspired by the idea to change the way people exchange their contact information. 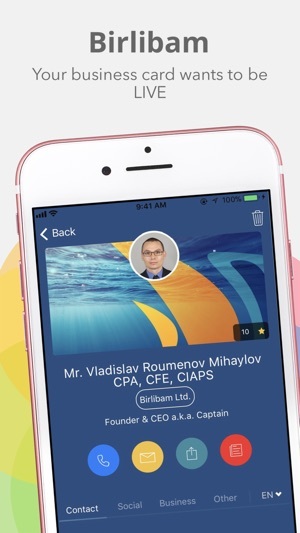 Now you have unlimited shares with your partners, colleagues or friends. And more – never lose your important contacts again – they are in the cloud. Create and personalize your new digital cards. It's free! • Personal cards for your friends. • Freelance cards for your business. • Add multiple languages to your cards. Share your cards easy, fast and unlimited times wherever you are, even offline. 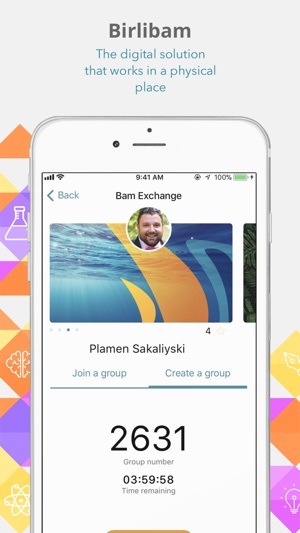 • BamShare for personal or group sharing. 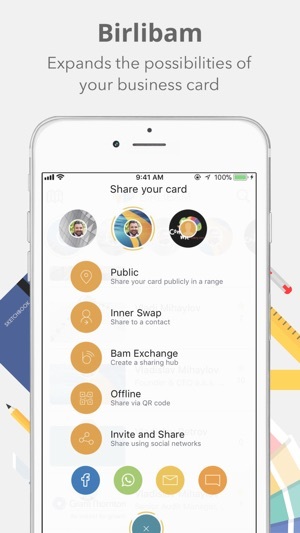 • Third party – share your collected cards with friends. • Public share – be visible to everyone near you. • Share while Offline via personal QR code. • Share by Email, SMS and social networks. Your contacts are always up-to date. • Edit your details and update your card. • Change your card with a new one. • Everything you do is in the cloud. 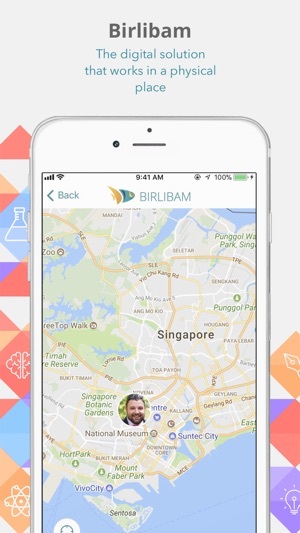 • Birlibam will notify your contacts for every change you’ve made. Easy access to your cardholder. • If you change your device your contacts will look the same way again. • If you forget your phone just log in from some other device. • You can easy log in from a phone, tablet or web securely. • Arrange your contacts in groups. Challenge yourself to be more productive. Every card has a personal rating. This rating serves as measure for friendship, integrity and professionalism. It is used to evaluate all business cards. To make the process more interesting this score will be reset every year and thus will provide a level playing field for all consumers in the race for your appreciation. Each card generates its own statistics for views, shares, adding, rating, etc. Keep in touch with your social friends. 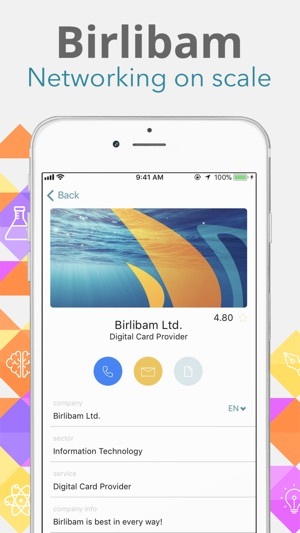 • View your friends which are using Birlibam and ask for their cards. • Invite your friends to join Birlibam. Last but not least, Birlibam is free and green – to create a Birlibam business card no tree will be cut and no pollution will be generated. More and more people I meet already have installed the app which makes it that much easier to exchange contact information and keep it updated.